Stuff loosely into neck cavity, then skewer neck skin to back. Sew openings shut by lacing piece of string on wood picks. Fasten down legs either by tying or tucking under skin band. Twist wings akimbo under turkey. Place turkey, breast up, on rack in shallow roasting pan. Brush with melted butter. If roast meat thermometer is used, insert into thick part of thigh. Bulb should not touch bone. 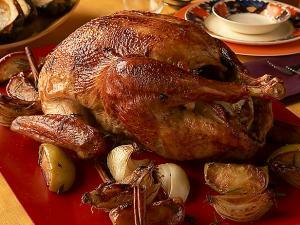 A tent of foil placed loosely over turkey keeps it from browning too fast and may be removed when necessary to baste turkey. Remove foil last half hour for final browning. Turkey is done when thermometer registers 180 to 185F, or when thick part of drumstick feels tender when pressed with thumb and forefinger or when drumstick and thigh move easily.